Peter Halm original etching "Munster auf der Reichenau"
Medium: original etching. Executed in 1900 and published in Leipzig, Germany for Zeitschrift für Bildende Kunst. 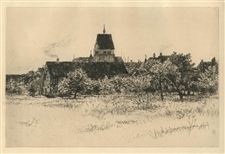 This impression is printed on cream wove paper; the plate measures 7 1/2 x 11 inches (193 x 280 mm). Not signed. Condition: there is a tear in the right margin (not extending to the platemark).